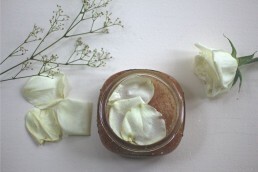 May Renewal: Miracle-Moisturizing Sugar Scrub. 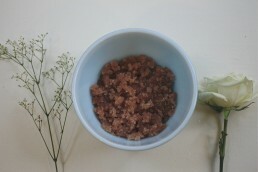 This sugar scrub is a decadent way to treat your body. Be sweet to your skin. The combination of my favorite oils and the eternal symbol of love —rose petals, make this body-buffer my seasonal go-to. I use this scrub after a long soak in a bubbly tub, or before a week on the beach. It leaves my body feeling nourished and new. 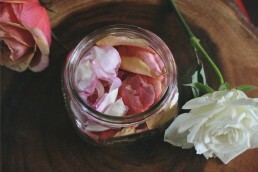 Give the petals about 20 minutes to soak in the almond oil. 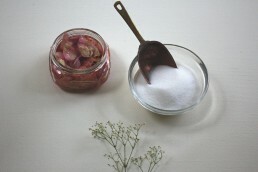 Blend the Petal and Sugar mixture in a food processor until combined. Once the ingredients have liquified fold them into 2 cups of pure cane sugar. Add in the 3rd cup by the spoonful, you may only need a bit, you may need the whole cup. Blend with a fork and spatula, ensuring that the mixture is coarse, but combined. 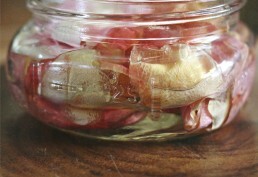 Tightly pack the sugar scrub into a mason jar. I layer fresh white petals on top decorate, and to keep the oil from the seal. This scrub is a great way to embrace the swing of the seasons. Use this body-buffer to unveil your smoothest skin, to soak in sunblock & get an even tan!